If you're looking for a restaurant with the most out-of-Singapore vibe and view, then it's definitely The Knolls at Capella Sentosa! The South China seafront setting and the Mediterranean fine dining experience help to trick your mind into thinking you're on a holiday (a good enough alternative if we really can't escape the island). 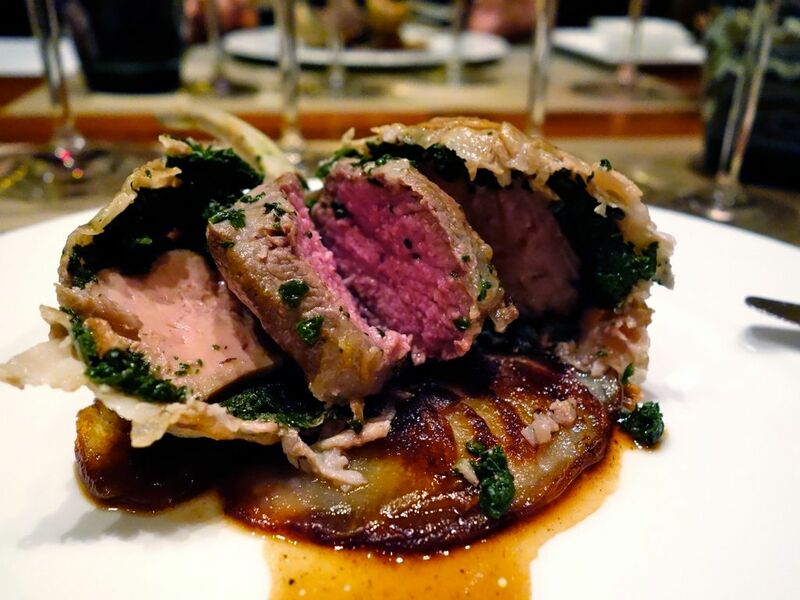 What i like about The Knolls is that on top of the regular offerings, they also provide diners with exclusive culinary experiences from around the world. I previously had the chance of sampling the dishes created by British 2 Michelin Starred Celebrity Chef Tom Kerridge of The Hand & Flowers. 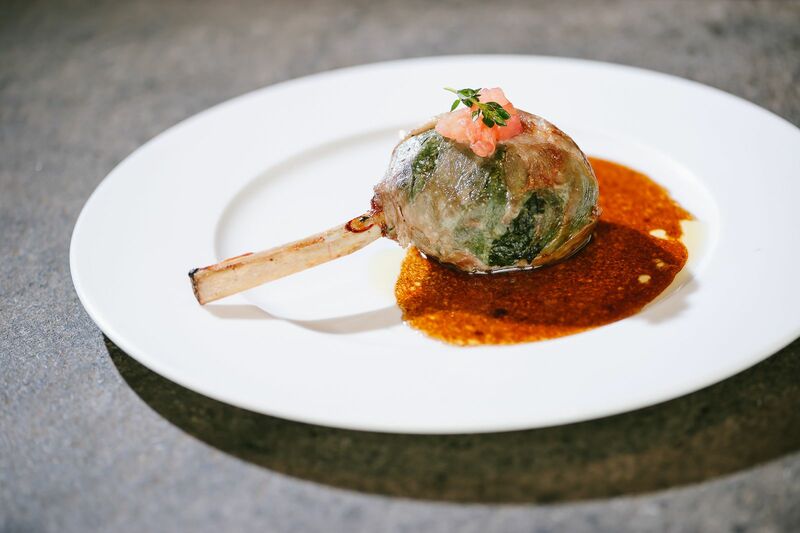 This weekend, one-Michelin-starred Chef Alain Llorca from Nice will dish out a slice of Provencal Michelin together with Capella Singapore's Culinary Director David Senia, presenting diners with a line-up of contemporary French Mediterranean cuisine. The events include gourmet lunch (4 course $78/pax) and dinner set (5 course $98/pax) menus at The Knolls for the public as well as an intimate MasterClass at Chef’s Table perfect for group sessions. For Sunday Brunch, there would even be a live demonstration by Chef Alain. Here's a look at the dinner set menu with wine pairing ($198). The meal started proper with the starter of a Hot Foie Gras from Chalosse cooked on embers to give it that lovely sear all around. The creamy slice was then topped with a crunchy hazelnut crumble, and glazed with an intense bittersweet coffee jus for that kick. Dig right through the liver to reach the tangy earthy mushrooms and send the whole spoon of goodness into your mouth. 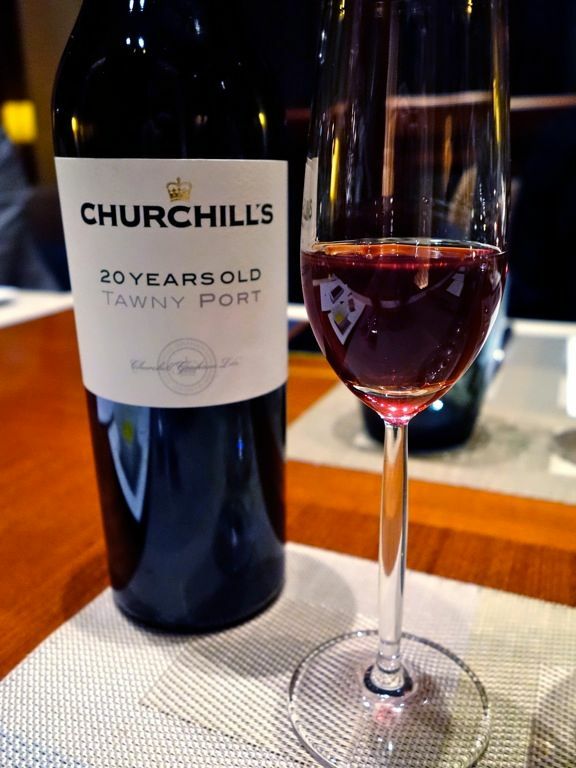 The berry component as with most foie gras dishes came in the form of a Churchill's 20years old Tawny Port. Port is typically served at the end of the meal but it works here too due to the light sweetness. Next, the Langoustine cooked with a sweet crunchy chutney of peppers and fruits. 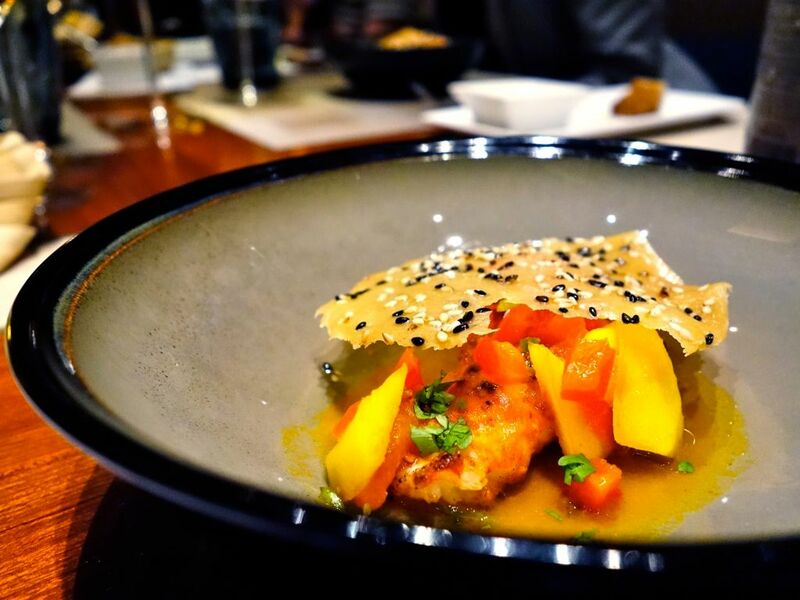 The tangy juiciness complemented the salty-sweet crustacean and the crispy sesame tuille provided an added fragrant crunch to the dish. This was paired with a 2011 Olivier Leflaive, Meursault, Côtes De Beaune, France. This limpid light yellow wine has distinct honeysuckle fruit on the palate, with a hint of mineral. 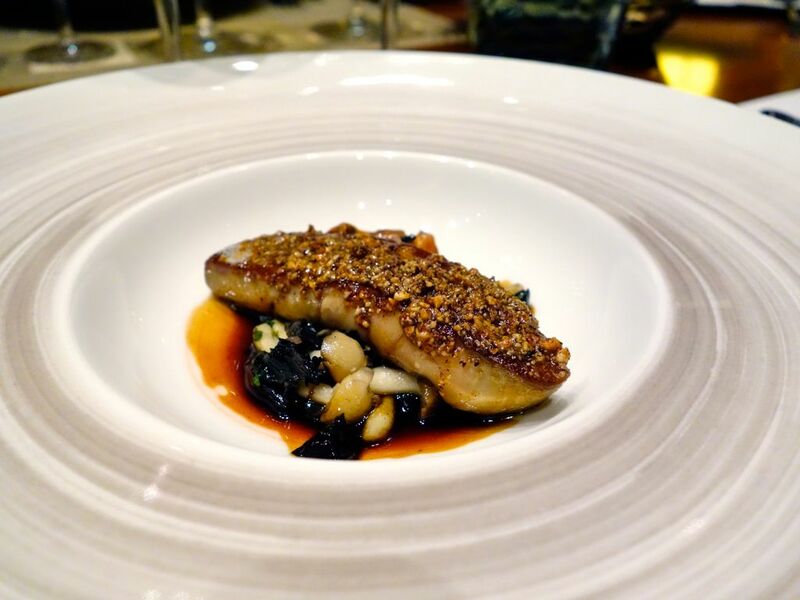 The dish of Mediterranean Sea Bass came looking like a pretty island. 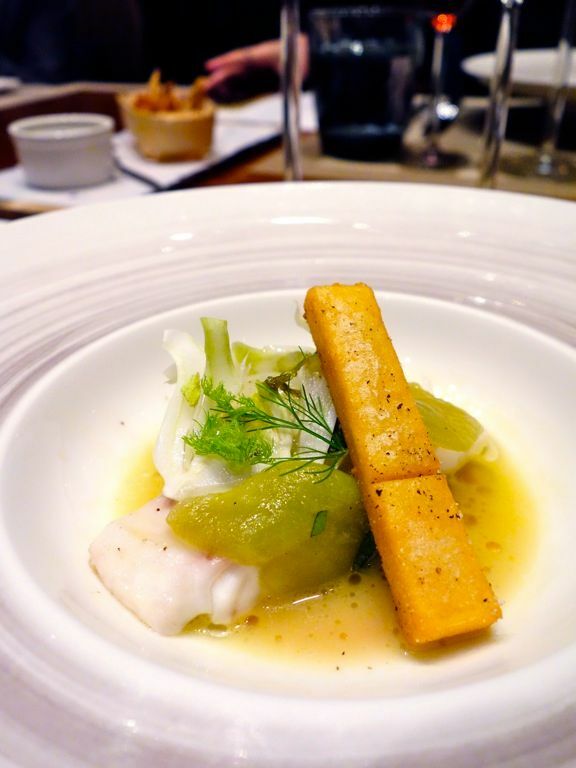 The sweet firm fish was adorned with slices of lemony fennel and a slightly tart green tomatoes. Have the stick of buttery chickpea finger (dusted with some Mediterranean spices). 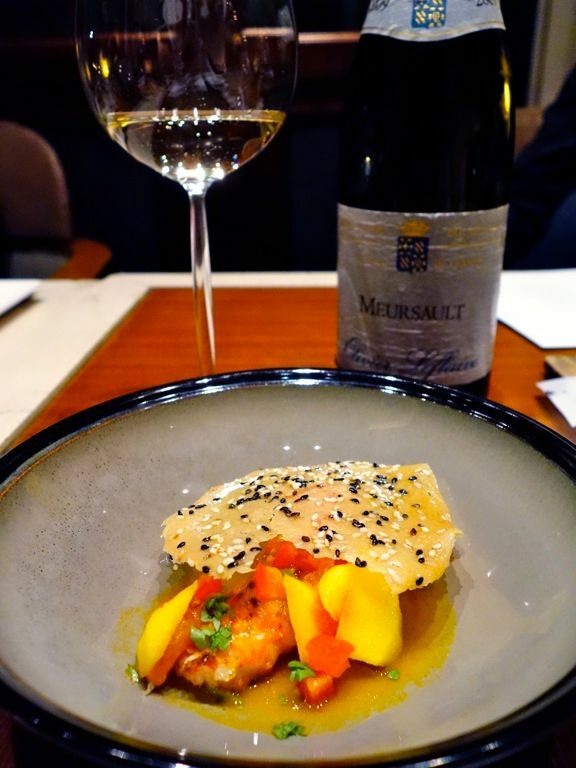 Light flavors in this one, paired with a a white Bordeaux- 2011 Chateau Haut Selve Blanc. This smells of clay and tastes of blue cheese (to me at least), long finish with a slight bitter ending. A surprise bomb of Rack of lamb, Rossini style was amazingly juicy. It made a squishy sound as i was trying to cut the ball into half. The perfectly pink meat was wrapped with spinach and duck liver, and rolled together with bacon. While the meat was perfect, i thought the liver added a little gaminess to the mix. And could we have more of the roasted silvers of earthy potatoes please? I enjoyed the 2011 E.Guigal, Gigondas Rouge from Northern Rhone Valley, France. It has pepper notes with rich fruits. Smooth drink it was! We ended the meal with an interesting Milk chocolate and Star Anise sphere. 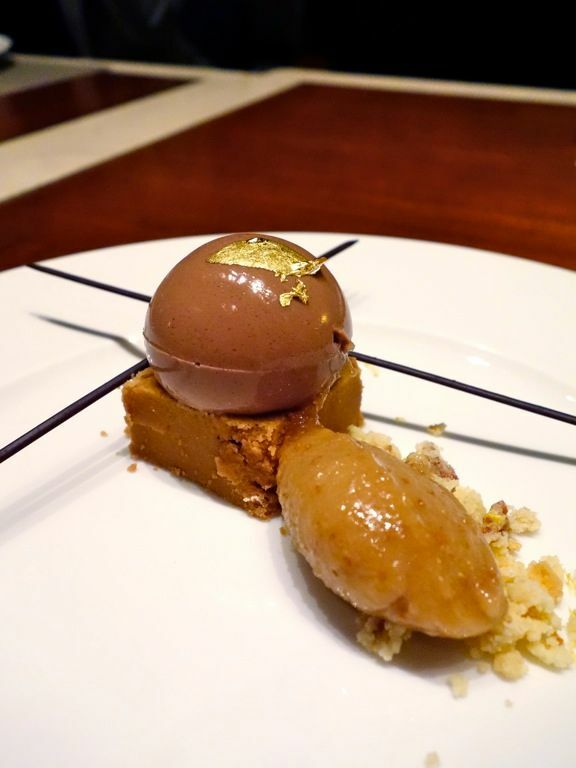 Like a basil parfait, star anise is seldom used in desserts but Executive Pastry Chef Bastian Jarry introduced it to provide a hint of Mediterranean into this dessert. I polished the dish. Notable is the "soil" of smooth cookie crumble that the sphere sat it. It melts instantly, like a traditional chinese peanut cake. Delicious. The Alain Llorca Experience is only available from 5 - 9 Oct 2016. Book your seats NOW. If you don't catch it in time, well.. Capella has some new offerings lined up for October. 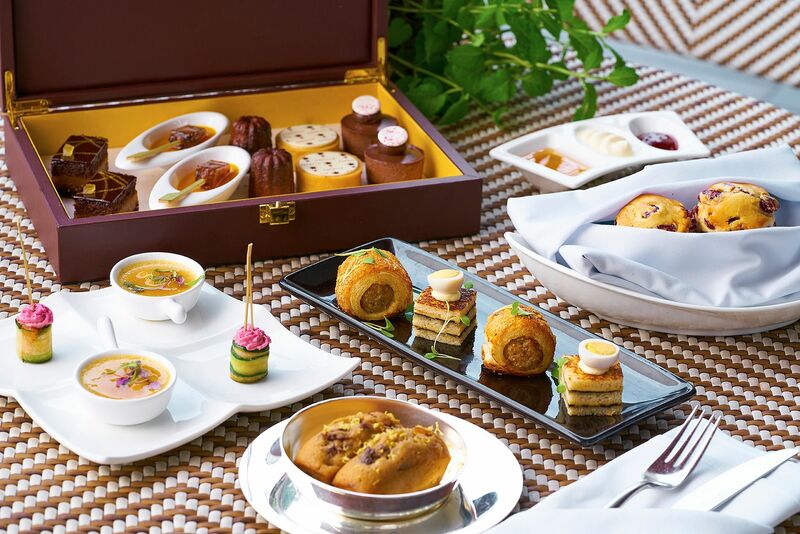 Make sure you salsa to the Cuban Festival on 15 Oct. A refreshed menu at The Knolls, and a new weekday Afternoon Tea ($39.90, 3 - 5pm) at Chef's Table. Check out the offerings here- Capella Dining.